The Teacup Cottage is a luxury self catering holiday cottage combining all modern comforts in a warm classical interior. It is the ideal base to discover Kent, the Garden of England. 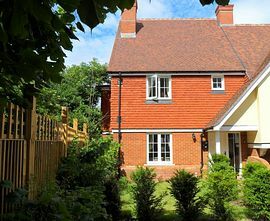 The Teacup cottage has 4 bedrooms and is located in Goodnestone, village of natural beauty, just a few streets big, but as a typical rural English village should be. In this picturesque town, you'll find everything a country village needs: church, pub and post office. Here, you'll find rest besides a network of walking trails, the famous public footpaths, Goodnestone Park and within only 15 km you become immersed in the rich history of Canterbury. Take the train to London 2012 Olympics in 40 minutes! You can find detailed driving directions on our website. More details on our website Link above.